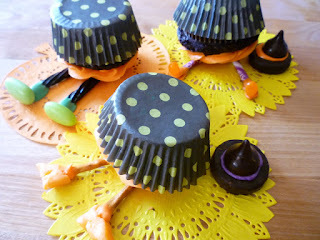 So today we're having family and friends over for a Halloween dinner, and for desert my mom made these neat cupcakes with witch hats on them. So I thought this would be a good time to tell you guys about a lady I met named Brenda Vanover! Brenda created the idea for the cupcakes and make really need things with candy and sweets. Seriously, she has the "eye" for all things candy and makes things that are truly impressive, but still simple to make! She runs sweetsimplestuff.com where she shares her creations! I strongly recommend you guys check her out. So for the hats, Brenda uses York Peppermints, but the ones my mom bought were shaped like pumpkins for Halloween so they didn't work and she had to improvise and use the cookie parts from Oreo's. They're made with a Hershey's Kiss, some frosting, and a York Peppermint. You can find the instructions at Brenda's site here. Here's one of the great things she uses the hats in. Keep an eye out for this one! Your Mom did a great job! Sometimes it's all about improvising.